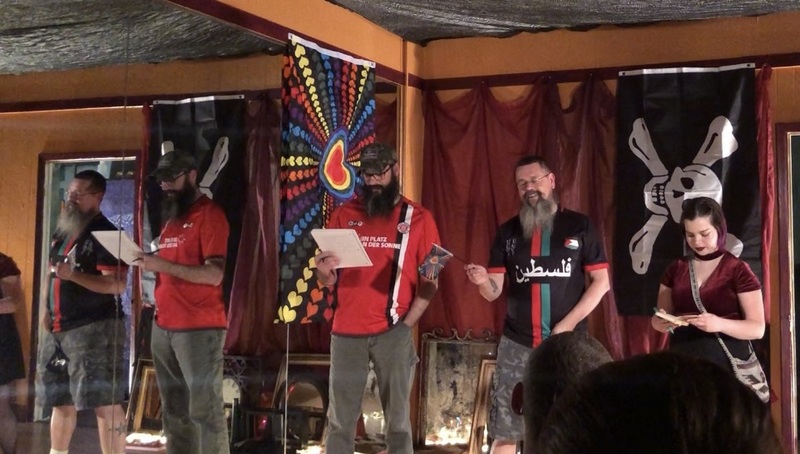 The return of Raven Mack’s Southern Gothic Futurist Haiku Slam finds local poets going head-to-head in 17-syllable bursts. 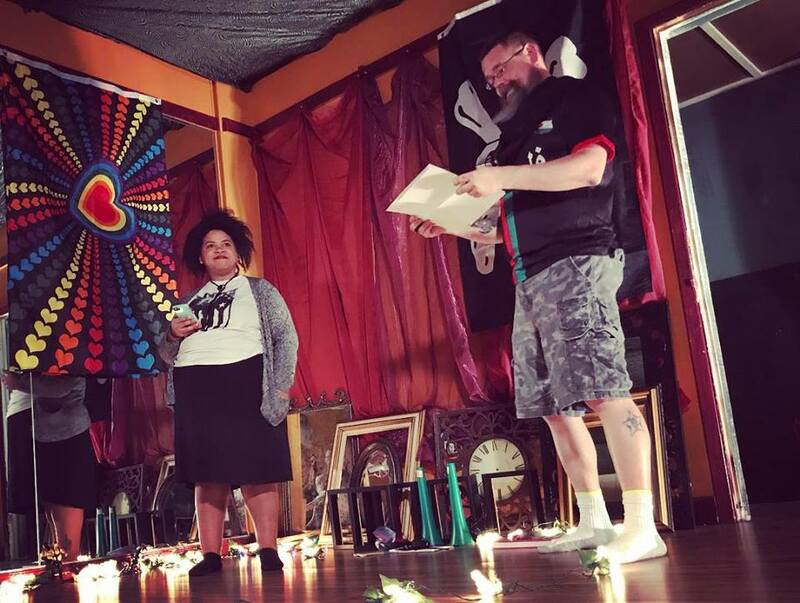 On Friday, March 29, Charlottesville poet, writer, and zine creator Raven Mack brought his long-running haiku tournament back to Richmond for the first time in 2019. Now known as the Southern Gothic Fvtvrist Haikv Slam, it’s gone by several names and appeared in several venues (most often in Charlottesville) over the years. This time, it took over the Electric Nomad Dance studio downtown, and poetic hijinks soon ensued. This free public event invited anyone in the area to participate in the evening’s main attraction, a single-elimination come-one come-all haiku tournament in which combatants build and/or destroy through their short poetic bursts. The atmosphere at Electric Nomad Dance was intimate and welcoming, creating a safe and open space for sharing of creative expression. The room was filled with individuals of all ages and backgrounds — some who came as competitors, some who just wanted to watch it all go down. He then went on to explain the “Southern Gothic Fvtvrist” movement that had given the event, and his latest zine, their current names. “The spirit of Southern Gothic Fvtvrist began with me in Southside Virginia,” said Mack. “I started to feel it all my life, because there’s a spirit of resistance you feel when you have to struggle.” He summed up by saying that the true spirit of the “Southern Gothic Fvtvrist” movement is living by your own ways, and creating your own zone, regardless of the boundaries typically applied to art by the mainstream creative establishment. After this, it was time for the tournament. Three judges were picked from the audience, two of which were Twila Jane, who runs Electric Nomad Dance, and John Campbell, a member of Lamb Of God. The third was… me! So what happened from there was a bit of a blur, as I was mainly focused on judging. 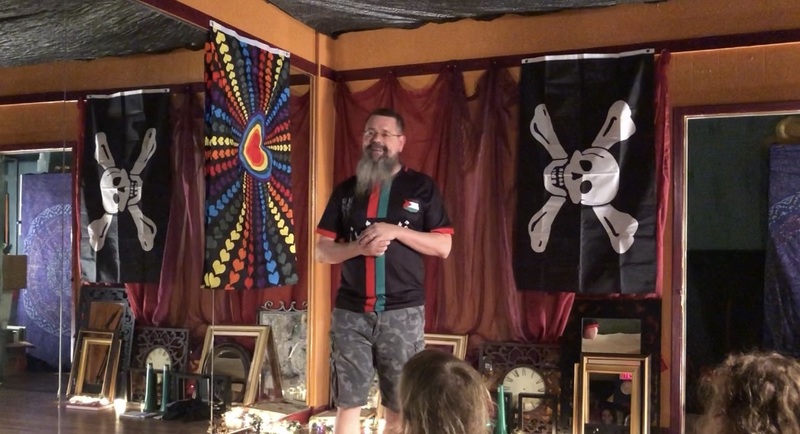 As the host, Mack never competes in the haiku tournament itself, but he does have a “haiku deathmatch” at each haiku slam, in which he and a single competitor go head to head with 18 haiku apiece. This time, he was competing with Celina Nicole, co-organizer of the Richmond Zine Fest, with the theme being “Dating in the Digital Age.” Mack ended up prevailing in the match, but it was close… and he gave a prize pack to Celina Nicole anyway. The main tournament started out with six competitors, who went against each other bracket-style. Match results were determined by judges, and the competitor who had the best two haiku out of three went on to the next round. Throughout the tournament, Mack referred to everyone as “Cousin,” which was intended to emphasize the connections between everyone present, even those who didn’t know each other. Competition in the tournament was entertaining, as contestants each showed their unique style while also choosing pre-written haiku on the fly to respond to their competitors’ poems. This created a connection not only between the two poets onstage but with the audience as a whole. For extremely short poems, the haiku went deep, with some striking a humorous tone while others were downright depressing. Regardless of tone, though, all created a feeling of familiarity. The evening was sponsored by Building Experiences, a Charlottesville non-profit working to help young people as they grow by providing mentors and support. Despite its focus on competition, it ended up feeling most like a community being created, live and in person, within the intimate confines of a dance studio. Mack hopes to return to Richmond in May for another haiku slam, and whether you want to write a few haiku and join the tournament or just enjoy the show, it’ll be well worth your time.